Yaquina Bay Light House...only 3 years of light. Yep, through our research we discovered that the Bay Light House only shined it's light for a total three years! It was on the schedule for demolition. Why? Let's look into history. Yaquina Bay was scouted out as the "next" possible San Francisco. According to the investigation done by an influential Willamette Valley agriculturist. He calculated the bay could easily hold up to 1000 ships and the entrance to the bay was easily navigable. Build a railroad to the bay and "Wa La", you have another busy port like San Francisco. It wasn't long after that schooners were anchoring in the bay filling their holds with lumber and oysters bound for San Francisco. A wagon road was built connecting Yaquina Bay to Corvallis and on the horizon for construction was a railroad. It was 1870, Congress authorized the construction of the Yaquina Bay Light House. They saw the potential that Yaquina Bay offered, the next San Francisco. The maritime industry was growing along the Pacific Coast and Yaquina Bay had proven it's right to be "lit". The research began looking for the ideal Light House location. 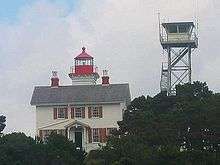 The Light House Service district engineer recommended that a Light House should first be placed on Cape Foulweather or Yaquina Head. Later, another light house could be constructed in the bay. The engineer's words were merely recommendations; however, his words were not taken seriously. Construction of the new light house began in May of 1871 on the bays northern part. Unlike other Oregon Coast Light Houses, the construction went fairly well. By the end of October, 1871, the construction was complete. November 3, 1871 the light was lit for the first time guiding mariners safely into Yaquina Bay. During the construction phase of the Lighthouse, the Light House Board was reviewing the district engineers recommendations. They concluded a light house was needed on Yaquina Head. Construction began and the Yaquina Head Light House showed it's first beam of light on in August, 1873. This new light house proved itself worthwhile, casting a beam 19-miles out to sea. The next question, "what to do with the Yaquina Bay Light House"? It was not cost effective to have two light houses in the same vicinity, especially when one "out did" the other. It was a "no contest", the Yaquina Bay Light House was ordered to "shut down". The Yaquina Bay Light House cast its beam of light for the last time on October 1, 1874. The light house was occupied by caretakers for awhile then sat vacant for years. There was talk of re-lighting the light with the coming of the railroad; however, that dream never emerged. The railroad did make it to Yaquina Bay, the Oregon Pacific Railroad. The dream of Yaquina Bay becoming the next San Francisco still seemed possible. A steamship was making a scheduled run from San Francisco to Yaquina Bay. However, two passenger ships sunk while attempting to cross the bar coming into Yaquina Bay. Yaquina Bay was now losing its popularity as the next San Francisco. The passenger service from San Francisco to Yaquina Bay was dropped leaving Yaquina Bay "doomed". The Yaquina Bay Light House was put into action to help with the bar crossings; however, it was merely used as a "day beacon". It did not function as a full-service light house. In 1934 the state park authority acquired the Yaquina Bay Light House. In 1946 the plan to demolish the dilapidated building went into effect. There was no money available to save the Yaquina Bay Light House. The community of Newport had a different opinion. They rallied to save the oldest building in their community. The Yaquina Bay Light House also had some fame behind it. In 1899, Lischen Miller published a short story, "The Haunted Light at Newport By The Sea". The story evolved around the Yaqina Bay Light House and a captain's daughter who had disappeared in the abandoned light house. The Newport community desperately searched for donations but to the dismay of the community they could not raise the necessary funds. In 1955 the Oregon Highway Commission dedicated some money to keep the structure. In 1956, the Lincoln County Historical Society acquired the Light House through a lease for the purpose of a museum. In 1974 Oregon State Parks completely restored The Yaquina Bay Light House. It's a work of art and one that you must see. You'll get a glimpse of the craftsmanship that went into this structure. You can also get a feel of Lischen Miller's story, "The Haunted Light at Newport By The Sea". Even though the light house is completely restored you can imagine what may have happened when the building was in such dis-array. Take the time to visit this historical marker. Following Highway 101, exit at the sign for Yaquina Bay State Park. Follow the signs, it's easy to find.